Jeremiah Kissel expertly brandishes a sword as his foes slash and strike at him. 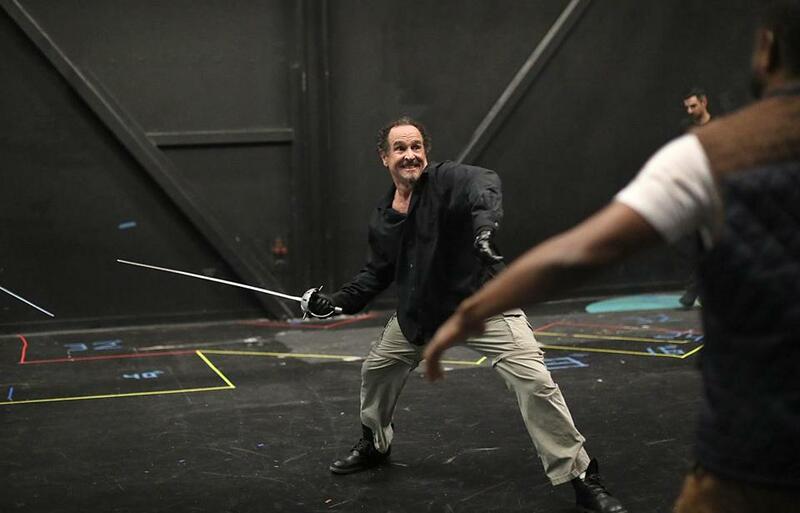 The swordfight is swift, powerful, and intense, which Kissel says is also an apt description of “Cyrano,” the romantic comedy running at Gloucester Stage Company Friday through Aug. 11. Playwright/actress Brenda Withers teamed up with actor Jason O’Connell for a new adaptation of the Edmond Rostand classic, “Cyrano de Bergerac,” deploying just five actors to play all the key characters. Rostand’s tale, originally written entirely in verse, follows a romantic idealist whose oversize nose makes him self-conscious and certain he is unworthy of love. Cyrano secretly pines for the beautiful Roxane, but when she falls in love with the handsome but dim-witted Christian, a soldier in Cyrano’s troop, Cyrano agrees to provide the words for Christian to woo and win Roxane. Although Roxane falls in love with the words and sentiments, Cyrano doesn’t reveal he is the author until it’s nearly too late. Kissel says he’s also struck by the adapters’ understanding of the relationship the characters have with language and to the themes of the play. Director Robert Walsh says the dialogue in “Cyrano” is breezy and insouciant while honoring the spirit of the original script. Tightening the play to work for only five actors focuses the story, Walsh says, on the essential emotions. Courtney O’Connor has been named the new associate artistic director at the Lyric Stage Company of Boston. O’Connor’s directing work has ranged from “Blood on the Snow” at the Old State House to a community-based production of “Our Town” in the Berkshires, as well as productions at the Lyric, Nora Theatre Company, and elsewhere. She is on the faculty at Emerson College and has served as education director for Commonwealth Shakespeare Company and artistic director at Tremont Street Project/Coyote Theatre Project, where she oversaw the creation of more than 150 new 10-minute plays by at-risk youths from Boston. “Love! Valour! Compassion!” runs July 16-Aug. 30 at the Provincetown Theater. Tickets are $40. Go to www.provincetowntheater.org or call 508-487-7487. Double Edge Theatre’s summer spectacle returns with “We the People,” a new version of the production that debuted in 2017. This year’s “We the People” reflects the company’s 10-month exploration of surrealist artist Leonora Carrington, and examines the connection between imagination and the world. While traveling around meadows, streams, and barns, audiences will hear the stories of a farmer, a poet, an immigrant, a suffragist, and others who resisted social and political oppression at different times and in different places. Always an adventure worth taking, Double Edge’s spectacles include music, aerial acrobatics, dance, and performance surprises. “We the People,” runs July 18-Aug. 19. For tickets, go to www.doubleedgetheatre.org.